Grandshaykh Sayyid Muhammed Efendi k.s. 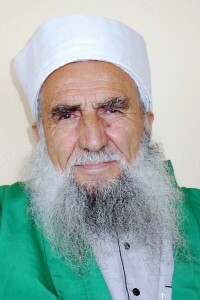 Shaykh Sayyid Muhammed Ustaoğlu Efendi, was born in Kayseri, in the year of 1928 which is the region where his ancestors were settled 8 centuries ago, bringing Qadiri order with them to Anatolian soil. He has started his education at the age of five with his father Osman Efendi. Later he has passed through the education of well-known alims of the region like Chorakchizade Haji Hussein Efendi, Haji Yusuf Eken, The imam of Camii qeabir Ahmad Efendi. Later, he went to Ankara and Istanbul and attended the ilim circles of Omer Nasuhi Bilman who was a famous alim of the time. He has stayed with Said Nursi for a while and benefited from his talks and has kept seeing him from time to time. Muhammad Efendi has worked as imam and preacher in many parts of the country and found himself in the doors of courts form time to time due to difficult conditions of the time. Murshid (trainer in path) Muhammed Efendi who has been kneaded in ilim(sufi term for all sorts of knowledge) and irfan (insight, wisdom) circles, acts as Murhid for Qadiri Sufi Path which he has inherited form his ancestors, Halidi-Nakshi which he has inherited from his father, Abhari which he has taken hand for from Chorakchizade Haji Hussein Efendi and Mawlewi which he has taken from Said-i Nursi. In the base of the teachings of Murshid Muhammed Efendi is being in constant state of repentance and the principle of it being possible to get out of the spiritual weight of the world with sincere submission and zikr (remembering the names and attributes of Allah) and never giving up hope. Running after ones worldly needs without isolation from life, but in every move to remember the divine call in our hearts as the router of our life and actions being shaped in the light of it are being preached.